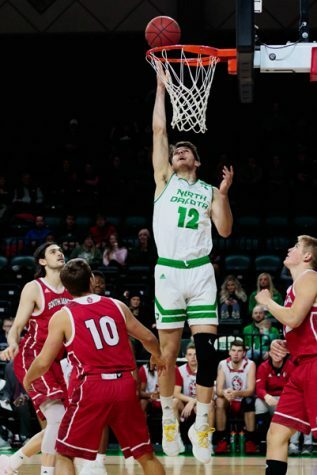 The University of North Dakota Men’s basketball team picked up their biggest win of the season on Saturday afternoon at the Betty Engelstad Sioux Center. 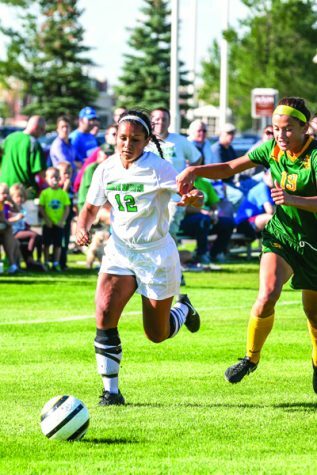 With the win over Denver, the Fighting Hawks officially clinched a spot in the Summit League tournament in their first season playing in the new conference. While eight of the nine teams in the Summit League qualify for the tournament, it’s still a nice accomplishment, especially for a program that isn’t used to this high level of play on a daily basis. 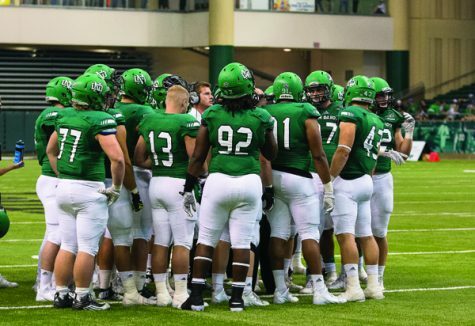 None of this is to say that the Big Sky (UND’s former conference) has “easy” competition, but there’s no question that the overall talent level and depth is stronger in the Summit League. 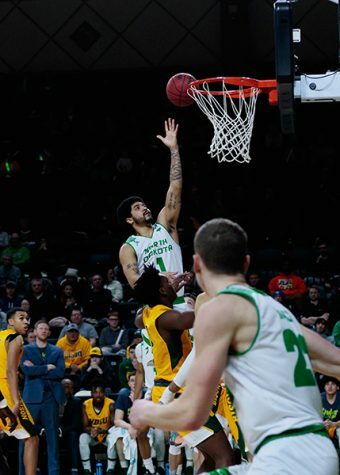 The Betty was rocking on Senior Day as hometown fans got their final glimpse of Cortez Seales and Conner Avants in Grand Forks. Both seniors played well in their final game at home. Avants, who was out previously due to an injury, appeared in his first game since Jan. 19 but didn’t look rusty at all. It’s tough to return to action after missing more than a month and still find a way to make an impact, but Avants did just that. He only played a total of 19 minutes, often in short bursts, but scored 11 points on an efficient 5-of-9 shooting from the field to go along with five rebounds, two assists and two blocks. Even though he didn’t see a ton of time on the court, it was great for fans to see Avants back on the floor helping his team get a much needed win. Seales, like Avants, had a quiet, but nice game. He finished with 12 points and three assists in his final game in Grand Forks. Despite being a day about honoring the seniors, it was actually three juniors, Marlon Stewart, Kienan Walter and Billy Brown, that led UND to victory. Stewart had an impressive first half shooting the ball. He went into the break with 15 points on an efficient 6-of-9 shooting from the field and 3-of-6 shooting from 3-point land. He cooled off in the second half, but his first-half performance was enough to give UND a 14-point lead going into the locker room. Opposite of Stewart, Walter made his mark in the second half. 13 of his career-high 19 points came in the final 20 minutes of play. Walter also added five rebounds and three assists. Brown played a game-high 36 minutes and scored 18 points on an uber-efficient 7-of-11 shooting from the field and 4-of-6 shooting from deep to go along with four rebounds and three steals. Brown didn’t lead the team in any of the three major categories (scoring, rebounds, assists), but his decision making was phenomenal. He came off of screens effectively, he made the right passes, and he knocked down shots when called upon. 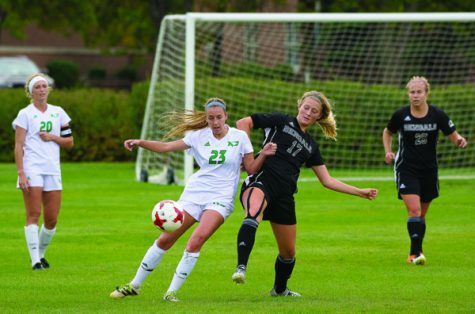 UND’s final two regular season games will be on the road against Purdue Fort Wayne and South Dakota. 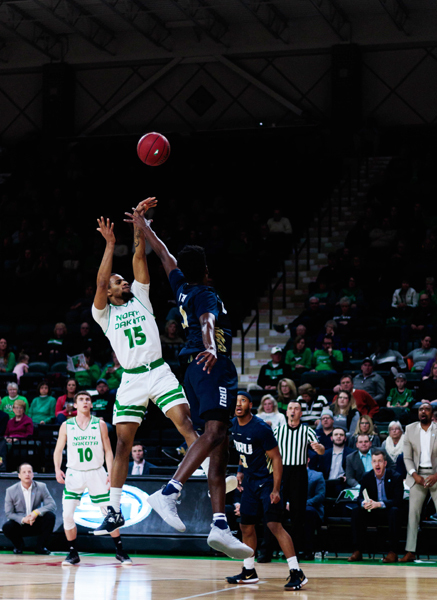 Neither of those games will affect whether or not UND qualifies for the Summit League tournament as that was locked up on Saturday afternoon, but both games can potentially alter the seeding heading into the tournament. 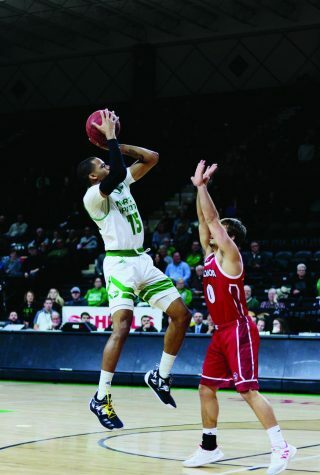 UND will try to do all they can to move up in the standings providing them with a better chance at a first-round upset.